15 Beautiful Wedding Dresses On Rent To Rock All Those Wedding Occasions! This Story was updated in January 2019. 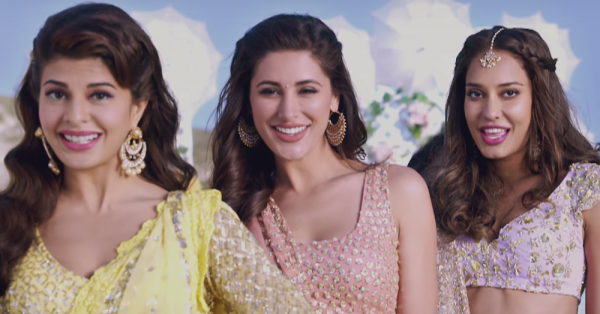 Bestie ki shaadi and wondering what to wear and how much to spend? Yeah, we get it! There are just too many functions and you definitely will be the centre of attention. But buying 5 different outfits seems like way too expensive affair, right? Well, why buy when you can get wedding dresses on rent! Yes, you heard it right. Have a look to know more about it. We found you 15 gorgeous wedding dresses on rent for all those wedding occasions where you don’t wanna spend much money. Each outfit is prettier than the other and they are the designer pieces too. The best part is that you can get all of it without even burning a hole in your pocket! Love the subtleness, the light colours and the delicate work on this one. So pretty and feminine. Pair it with danglers and leave your hair loose. This lehenga on rent is truly a stealer! Rent: Rs 3,299. Rent it here. 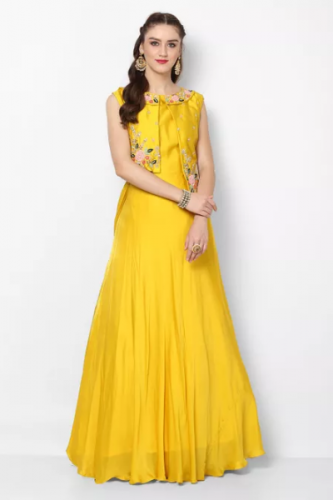 A citrus yellow gown with zari work is perfect for the morning functions. Fun, playful and flirty, this is sure to make you stand out. Slip on a statement ring to go with it. Wedding dresses for girls like this will definitely make heads turn! Rent: Rs 2,700. Rent it here. 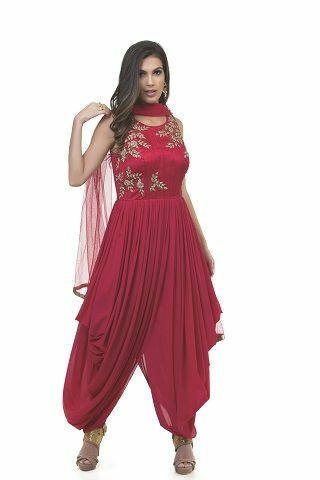 A deep maroon top with coordinating tone sharara set is the outfit that comes with a pre-stitched coral dupatta. 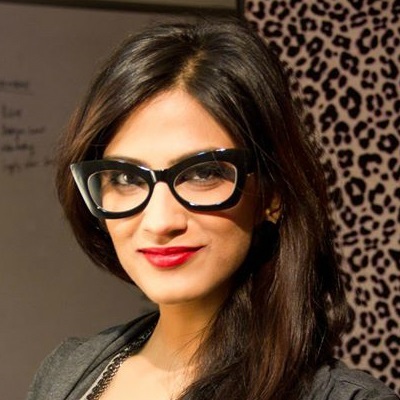 It’s super stylish and will make you look totally ramp ready! Rent: Rs 3,999. Rent it here. 4. Like a desi girl! One can never go wrong with a saree. Especially if it looks like this! An elegant pre-stitched saree with a gorgeous brooch on the shoulder, this one’s a show-stealer. Ultra comfortable and stylish to rock any occasion. Rent: Rs 2,999. Rent it here. A gown? A dhoti? Or both?! A striking red dhoti drape gown, this one’s for the girl who wants to dance the night away at the bestie’s sangeet! Such wedding dresses for girls must be paired with a wrist cuff and high heels. Rent: Rs 3,000. Rent it here. We are so in love with this outfit! A gorgeous pastel lehenga with a beautiful flare and floral work on the blouse, it looks just so dreamy. Rent: Rs 13,999. Rent it here. A dark green long tunic that has gold zari & sequins floral embroidery at distinct placement all over is paired with a peach embroidered palazzo, now that’s some serious fashion. 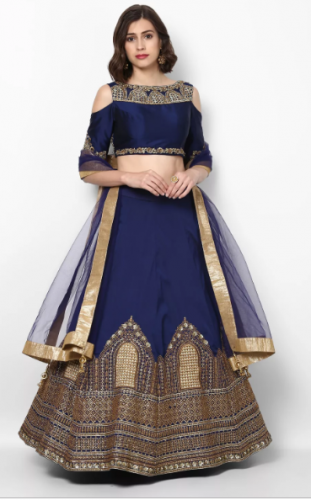 Featuring a round neckline, this lehenga on rent is an ideal choice for the reception or cocktail night. So classy! Rent: Rs 1,499. Rent it here. Pink and orange continue to be quite the combination for the shaadi season. For your bestie’s wedding, wear this with a pretty maangtika and a lipstick in a bright shade of pink. Rent: Rs 4,500. Rent it here. An extremely beautiful anarkali delicated with floral embroidery work, this needs to be on every bridesmaid’s wishlist. 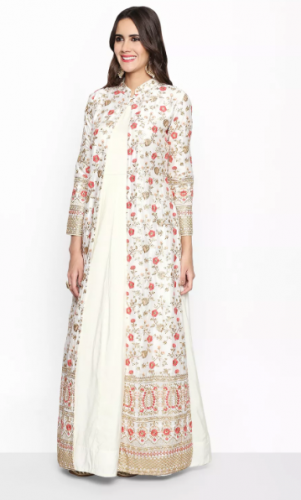 Paired with a white soft net dupatta, this one is truly a divine creation! Rent: Rs 1,799. Rent it here. Such a gorgeous outfit! A royal lehenga skirt with a coordinated royal blue sequined blouse. 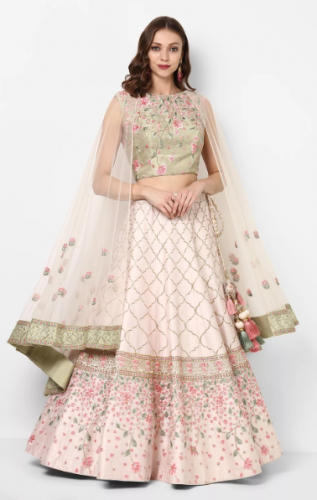 A beautiful combination, this lehenga on rent would look fab at your bestie’s cocktail function. Style it with offbeat accessories to complete the look. Rent: Rs 2,499. Rent it here. On the sangeet ki raat, a fawn green sharara set seem like the way to go. Accessorize with a stunning passa or pretty chaandbalis. And if you’re a fan of gota work, then this is crafted just for you! Rent: Rs 2,499. Rent it here. An elegant anarkali and churidar set with golden applique work, this is a shaadi essential. You could wear it during the day or pair it with heavy accessories for an evening function. Loose curls and pretty earrings will complete the look perfectly. Rent: Rs 3,499. Rent it here. Captivating black saree gown is crafted with soft net and is sleeveless that makes it look completely stylish. It is basically a gown that gives an illusion of a saree drape. The outfit enhanced with delicate beauty embroidery patch that looks just amazing. Rent: Rs 3,199. Rent it here. This crop top with a skirt looks completely stylish to be adorned on parties. The black one side wrist long sleeve crop top looks really amazing and the flared skirt gives a princess-like look. Rent: Rs 2,720. Rent it here. Pastel colours are all over in trend, so wearing pastel dhoti pant set on your friend's wedding would totally make you look breathtakingly gorgeous. Rent: Rs 1,799. Rent it here. We love them all! Which one's your favourite? !